We're a fresh restaurant/bar right on the Merrimack River! We offer crisp delicious drinks and a simple, but refined menu. The food is freshly prepared each day from scratch to deliver a unique and tasty experience. Come relax and enjoy the outdoors with the best waterfront views on the river. Be sure to visit our SECOND FLOOR LOUNGE! Come check out the new DECK expansion - we've added a second-floor roofed lounge area to give patrons an area of respit from the sun or inclement weather, while still enjoying their craft beer or specialty cocktail. As if the views weren't spectacular enough, you'll want to keep coming back to check out the sunset from the second floor. Our complimentary valet service is still readily available to assist your parking needs on a daily basis. Look for our attendents in the yellow DECK shirts to help you out right in front of the Deck entrance. 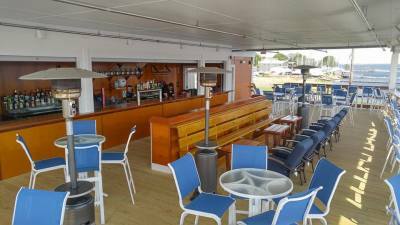 The DECK is located at historic Bridge Marina, the oldest marina on the Merrimack River. Since the 19th century the location has been home to an array of maritime facilities including ship construction, storage, and repair. The pier was erected by Star Davis Oil and served as the area's only source of heating oil. Since the 1960’s the site has been a full-service marina, offering hoist, wrapping, storage and repair facilities. Additionally, the site has provided gas to refuel on the dock and a retail store offering supplies. While The DECK itself opened in 2013, it was built from a restaurant institution. The Fish Tale diner once sat where The DECK is now – a train cart moved from Rowley, MA some 60 years ago. After decades of happy patrons, The Fish Tale was closed. Through a collaborative effort containing aspiring restauranteurs, cooks, and servers, The DECK was born. Despite challenges, the waterside pub continued to grow year after year. Though The DECK is still young, its foundation is a rich history of waterside business – a tradition to uphold.